"Classifying information and testing the accuracy of Classification Models"
Classification of information to organize large data sets is a critical tool in the drive to business value. So why is it that CIO’s desperately want to classify their information, but are not implementing and taking advantage of it? Read this informative whitepaper on ''Classification of the Information'' to learn how information can be classified in a number of ways to provide a better understanding of data. Accurate classification: Criteria to decide what and how text-based information should be migrated or discarded. 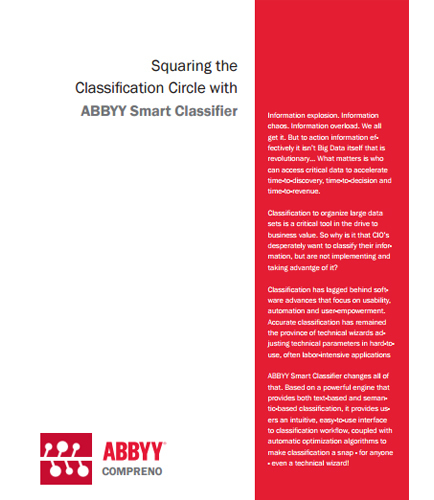 Download this whitepaper to understand more about Classifying information and testing the accuracy of Classification Models .